Anantara Si Kao, Thailand, overlooking the Andaman Sea. With all the comforts of large resorts, Anantara Si Kao is far from crowds, nestled between Changlang Beach and Had Chao Mai National Park. 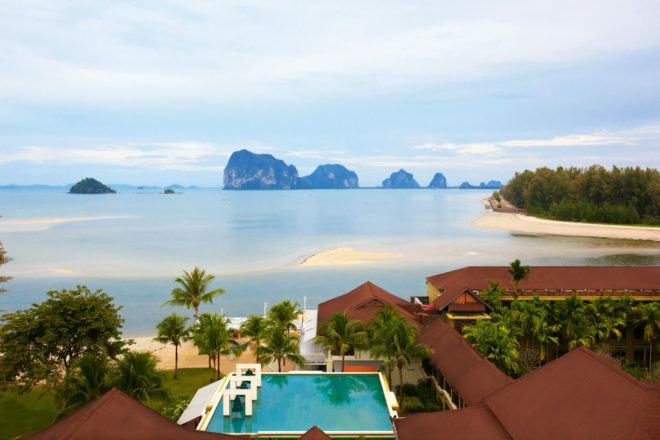 This is the only resort on the 15-kilometre long Changlang Beach, which overlooks the magnificent karst outcrops peppering the Andaman Sea in southern Thailand. Anantara Si Kao has the comforts of a big resort, but the added bonus of being miles from the crowds. The pastel-shaded guest rooms each have terrazzo tubs, wood trimmings and soaring views from their private balconies of the tropical gardens, distant mountains, overlooking one of the two pools or the beach. There is a gym, spa, several dining venues including a fine Italian restaurant, children’s club offering elephant rides, cooking classes and a sleek beach bar serving the best Thai-inspired cocktails for miles. Anantara Si Kao’s biggest asset is its remote location: next door to Had Chao Mai National Park, known for its dugongs and flourishing mangrove forests. It’s also a quick stroll from Si Kao town where beachside diners serve cold beer and yum talay – a zesty salad made from fresh baby octopus and jumbo prawns.